I saw this Meme on Rinda's blog and then again over at Deb's World and decided since I can't seem to settle on content, I'd play along! 1. What’s the title of the last book you read? The last book I finished was The Infinite Sea, the second in the young adult The 5th Wave series. Great easy read and I'm now awaiting the third in the triology. Unfortunately not due out until next May. Right now I'm reading Rising Strong by Brene Brown. Highly recommend any of her books! 2. What is the last thing you cooked at home? Cinnamon-Apple Pork Chops. Paired with mashed sweet potatoes. Definitely a fall meal! It's fairly quick and easy and Jay really likes it. 3. What is your favorite thing about Fall? It's a toss up for me between the colors - I love the red, orange and yellow in the trees with the sun streaming through - and the scents. There is something to be said for the scents that are generally only around this time of year! 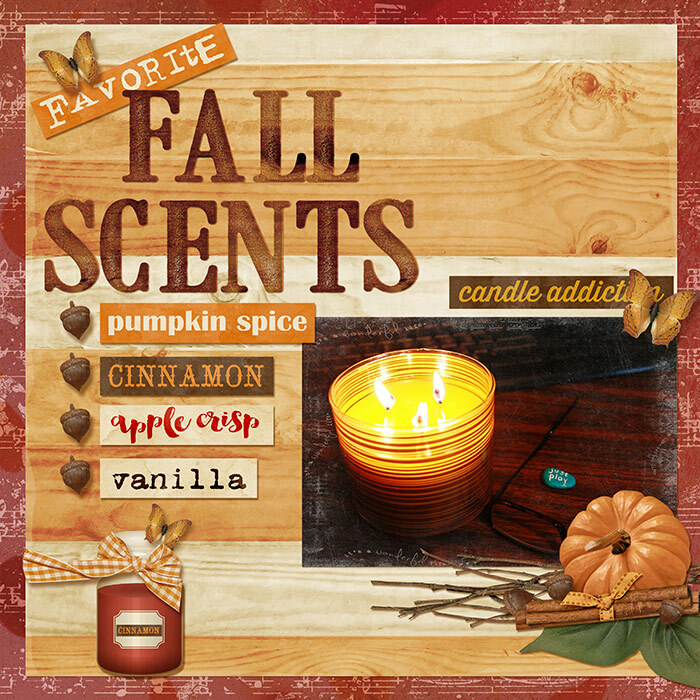 Layout created with Krystal Hartley's newest kit "Smells Like Fall"
4. Share one thing that challenged you at some point over the last week. The nasty head cold that I'm fighting. I actually called in sick on Monday and spent most of the day sleeping. I'm still working on getting better! 5. List three hobbies that you actively pursue or want to pursue. Hobbies that are being actively pursued at the moment include folded book art, upcycling furniture, and our shop at Black Rose. Hobbies that I really want to get back to include scrapbooking, art journaling, and mixed media. Goodness I miss them! 6. What is the most recent sporting event you watched? I think I caught a few minutes of an Eagles game last weekend. Seriously I'm not a sports fan unless my own girls are playing - and it has been awhile since they've played in anything I can watch. Sort of miss being a soccer mom! 7. Besides watching "live TV," what service do you use to watch TV or films (netflix, on demand, etc.)? We frequently use On Demand to watch shows that aren't on until 10 p.m. (like Chicago Fire) - we see them the next day. 8. Have you started Christmas shopping yet? Yes. I actually picked up some Christmas gifts during the Summer! 9. Do you have any upcoming trips? Yes. But that is a story for another blog post - after Christmas. 10. Do you remember your dreams? Yes. But generally only for an hour or so after I wake up. After that the details get lost and become very hazy. Last night's dream involved an alien species trying to integrate with us humans. The last thing I remember before I woke up was walking around spreading carrot bits on the ground for the little alien critters. No, I have NO idea where it came from! I think lack of sleep from this cold is making me loopy. What's happening in YOUR world??? Oh, hoping that lurghi will be soon gone, Cheri - it's really hard to function when below par so I am admiring the fact that you've managed to put such an interesting post together. Anything with cinnamon, vanilla and apple (preferably all three!) is a winner where I am concerned. Oh, and cardamom :). Fun read - and I've clipped that recipe as pork chops are on the menu for next week. Apple and cinnamon plus sweet potatoes yum! Great read! Hope your cold is over quickly; I had a moment while we were away when I thought I might be getting one, but I think I've escaped. (Hope that didn't jinx it.) I miss being a soccer mom, for sure, and it's been a LONG time, but I really did love it all. That sounds like a good recipe - I'll be trying that for sure! Hope you feel better soon, it's horrible when a cold just takes hold and refuses to go away. I wonder what that trip is that you are keeping secret! Enjoyed this catch up with you today. I know what you mean about missing being a soccer mom. I miss those crazy, hectic times---they went by all too fast. I do love retirement, but it's unbelievable to me how quickly the time has gone. Scary, actually! I try really hard to be mindful of each day. Hoping you're soon better. The colours of autumn are definately my favourite thing. I'm really enjoying all these posts around blogland. Might just get time to answer the questions myself next week. I love apple and cinnamon in my breakfast porridge, or a crumble, not being a pork eater. My carnivorous family would no doubt enjoy that recipe though. Very intrigued by your secret trip. Will look forward to hearing more in the New Year. Enjoyed reading your answers to this meme! So sorry to hear you've been sick - hope you're all better now. I enjoyed the fall colors we got to see this year on our trip! I haven't even thought about Christmas shopping yet, so you're ahead of me. Hope you are having a lovely weekend! I saw this meme on Rinda's blog and thought it was interesting, and now I see it here at your place again. Did you make the scrapbook layout? It is beautiful and reflects this special season. I like your dream, especially the part with the carrot bits! Hope you are feeling better Cheri, a lot of my blog friends seem to be under the weather at the moment. At least you can't all be passing it on to each other since there are oceans and miles between in most cases! I'd have serious withdrawal if I wasn't making books, and doing mixed media. I have picked up crocheting (again!) and often dabble with other projects but paper and photography are my pull. Hope you get back to scrapbooking and doing other things you enjoy someday. Tonight I had Cajon pork with orange. It's one of my easy but favourite meals. You simply coat the pork lion steaks in Cajun spices and gently fry til cooked. Towards the end you add an orange, thickly sliced and gently and brown both sides. Serve and while you serve accompanying vegetables quickly add the juice of another freshly squeezed orange into the pan. Heat through then pour over the pork. Yum!! Your dream made me laugh!and you are right that fall does have its own smell!